How Does a Caller’s Anger, Fear and Sadness Affect Operators’ Decisions in Emergency Calls? Reading: How Does a Caller’s Anger, Fear and Sadness Affect Operators’ Decisions in Emergency Calls? We studied how emergency operators’ interpretation of callers’ anger, fear, and sadness influenced emergency assessments in 146 authentic emergency calls. All emergency calls need to be decided on quickly and operators discriminated emotional expressions, by separating fear from other emotions across help need levels. Using path analysis and structural equation modeling, caller’s fear, as opposed to expressions of anger and sadness, showed both direct and indirect effects on the intention to provide help. Based on the findings, emergency operators are argued to actively incorporate callers’ expressions into emergency decisions, rather than peripherally processing emotional expression. Such findings allow for a discussion on the interpersonal effects of emotional expressions and, more practically, how fast help will be able to arrive to the location of the emergency. Emergency operators must make controlled and rapid decisions about the help to which callers are entitled. These decisions are based on verbal reports, provided over the phone, with the assistance of pre-scripted protocols. The accuracy and speed of the operators’ assessments, discriminating severe cases from less severe cases, saves lives as well as provides for equal care of callers. Research on the role played by the caller’s emotional expressions in these decisions is inconclusive. Rather than examining the situation itself and the words used to communicate it, this study considers the emotional content of calls to operators as expressed through non-verbal means. Previous studies claim operators are exposed to caller’s vivid emotions (Whalen & Zimmerman, 1998) and that the caller’s emotional stance, which may range from keeping calm to losing control, is crucial for operators’ understanding and assessment of emergency calls (Alfsen, Møller, Egerod & Lippert, 2015). Other studies claim that the emotional content of emergency calls is less dramatic than the public considers them to be. The latter assume that emotional expressions do not influence operators’ protocol-based decision making. For instance, Eisenberg et al. (1986) showed the mean emotional content of calls about cardiac arrest to be only slightly elevated in comparison to non-arrest calls. Using the same scale, Clawson and Sinclair (2001) and Ma et al. (2007) later confirmed these findings and, further, noted a general lack of negative emotional expressions (i.e., hysterical callers) in emergency cardiac arrest calls. Thus, examining the role of vocally expressed emotions in fast, accurate and formalized decision-making of operators is a divisive pursuit and questions remain unanswered. Nonetheless, a growing body of research addresses how discrete emotional expressions are vital for decision making in other organizational settings (Van Kleef, DeDreu & Manstead, 2010; Van Kleef, Homan & Cheshin, 2012). In that research, emotional expressions are social signals that inform perceivers about both the characteristics of the expresser and particularities of the setting (Hareli & Hess, 2010). Using a narrow scope of emotions, such as the level of “hysteria”, and a joint measure for emotions and decision making, as was done in previous emergency operator studies, the work of Eisenberg et al. (1986), Clawson and Sinclair (2001) and Ma et al. (2007),1 stands in contrast to the more recent studies by Van Kleef, DeDreu and Manstead (2010) and Hareli and Hess (2010) on the role of discrete emotions. Making aggregated assessments of emotional expression in calls about a certain decision category (cardiac arrest), rather than focusing on different types of emotions in relation to a range of emergency decisions, raises the risk of not capturing the true influence of emotional expressions on emergency assessment. For instance, making aggregated ratings of emotional expressions fails to recognize the nuanced information that discrete emotions (such as anger, fear and sadness) may provide. In addition, none of the previously mentioned studies nuance the intensity of the expressions. It is the intensity that potentially modulates both detection of emotions and inferences made about the caller (Van Kleef, Homan & Cheshin, 2012; Vidrascu & Devillers, 2005) in relation to other emergency decisions. This disconnection between earlier studies and current research is addressed in this study. Connecting to research on emotions as social information, we therefore propose that relationships between emotional expressions and intensity of expressions can explain the nature of fast and accurate decisions by emergency operators. We offer this explanation by addressing the relative influence and intensity of discrete emotions in a set of basic emotions (specifically, anger, fear and sadness), on actual emergency decisions. Emotions are directed towards a person, object or an event (Frijda, 1986), communicated through facial, postural and vocal expressions. Decoding them reveals intercultural continuity (Scherer, Clark-Polner & Mortillaro, 2011). While facial displays are arguably dominant over other emotional expressions, vocal expressions are accurately perceived surprisingly often. Basic emotions are decoded with an accuracy of between 70–90% (Banse & Scherer, 1996; Scherer, 2003) and negative expressions, such as anger and sadness, are more easily communicated than fear, happiness and tenderness (Juslin & Laukka, 2003). Expressions of emotion are difficult to disregard and they trigger perceivers to convert such input into decisions. For instance, anger signals a person’s goals are frustrated; often they project blame onto others. Fear is a response to negative, uncertain events, and sadness signals irrevocable loss (Lazarus, 1991). While all three emotions have negative valence, the latter two are considered to be signs of supplication that prime helping behavior (Kennedy-Moore & Watson, 2001); the former is a sign of confrontation and therefore, when displayed, expectations of helping behavior are lower. However, the influence of emotions is dependent on the situation in which they are expressed. Fear and sadness influence helping decisions positively, as long as they are expressed in a context that is overall a cooperative one. Anger signals dominance and aggression and is therefore likely to reduce cooperation in an overall cooperative context but increase cooperation when expressed in a competitive context (Van Kleef, DeDreu & Manstead, 2010). Thus, while anger expressed in a negotiation task may produce concessions in others, when expressed in counseling or advice-giving situation, it does not increase the chance of getting help. Conversely, fear and sadness expressed in counseling and advice-giving situations would increase the chances of being helped. Professionals in different service occupations (including emergency operators) are not immune to the influence of emotional expressions, but they are sensitized towards both managing their own and others’ emotional expressions as vital social information. Emotions are expressed with different configurations of voice cues (Juslin & Laukka, 2003; Scherer, 2003). However, voice intensity differs from other cues as it is subjectively heard as loudness. Voice intensity is thus a dimension that is often overlooked when assessing the influence of emotional expressions. Intensity potentially modulates both detection and inferences made about the expresser (Van Kleef, Homan & Cheshin, 2012). Banse and Scherer (1996) showed that many of the 14 different emotion labels were grouped into families that were categorically similar. However, each group differed significantly in level of intensity. Similarly, Juslin and Laukka (2001) showed that decoding accuracy is higher for intense rather than low-key expressions and that intensity is a variable that is possible to single out in speech. The importance of intensity for emotion recognition seems to apply in authentic emergency settings as well. Vidrascu and Devillers (2005) reported that fundamental frequency (F0) and intensity were the most relevant cues for discriminating between different emotions within the emergency domain. H1: Expressions of fear will influence the observer’s perception that the caller is in need of help. H2: Expressions of sadness will influence the observer’s perception that the caller is in need of help. H3: Expressions of anger will influence the observer’s perception that the caller is not in need of help. H4: The intensity of the caller’s expression will positively relate to the observer’s perception of providing help for supplication emotions (fear), but negatively for confrontation emotions (anger). By calling one of the 18 emergency centers, callers reach the ambulance, fire brigade, police, air and sea rescue, mountain patrol services or clergy. Approximately 850 employees work within the organization under study. Operators are internally trained in deciding which instrumental help to provide according to symptom-based medical decision index. The operators are accessible 24 hours a day, 365 days a year and answer approximately 700,000 health-care related calls annually. The operators (N = 7, Mage = 39.50 years, SDage = 9.98, Memployment = 6.2 years, SDemployment = 5.42, 43% women) from a metropolitan emergency center returned 146 ratings for analysis (Mrating = 20.8 per operator and SDrating = 6.20). An initial analysis of the 146 emergency priorities (identifying 41% as acute) were representative of the distribution of all emergency priorities (N = 19052, 37% identified as acute) that were made to the emergency center during the two-month period of data collection. Thus, the match of the sample with the overall emergency priorities together with the fact that operators could not know the type of incoming calls in advance – and therefore could not disregard any calls prior to answering – qualifies the sample as a randomized one. Minimizing interference with work, operators were instructed to rate the first incoming call regarding health-care matters during every 30-minute interval (i.e., two calls per hour). The operators were instructed to rate the type of emotional expression, the level of intensity and the level of perceived help for the first minute of the call. If the call lasted less than one minute, the operators were instructed to rate the entire duration of the call. Moreover, the rating material (see measurements) was counterbalanced within and between operators, making sure none of the operators had an identical rating sheet yet were provided with the same material. The material used for rating emotions follows a categorization of basic emotions (Juslin & Laukka, 2003). The reason for choosing a limited set of basic emotions (anger, fear and sadness) was done after consultation with emergency center representatives. Given the nature of the domain and the focus of previous studies (Clawson & Sinclair, 2001; Ma et al. 2007; Vidrascu & Devillers, 2005), these expressions are considered to be the most commonly displayed emotions that are related to each other, and it is possible to meaningfully discriminate judgments made by professional assessors.2 For instance, callers who are in need of help are more likely to switch between expressions of fear and expressions of sadness, rather than expressions of anger-fear and anger-sadness, since the former two are examples of supplication emotions. Switching between anger-fear and anger-sadness is thus less expected as it implies a relation between a confrontation and supplication emotion. The measurements followed a Likert-convention, frequently used in previous studies of emotion perception, and contained a scale for each emotion of the three emotions, where 0 equaled no expression and 10 very clear emotional expression (cf. Laukka, Juslin & Bresin, 2005). Considering that previous research claims that emotions, which are expressed with various level of intensity, influence detection as well as inferences about the expresser (Laukka, Juslin & Bresin, 2005; Van Kleef, Homan & Chesin, 2012), a similar Likert scale was included for intensity of emotions (0 equaled not at all and 10 very strong intensity). Fear is expected to show a stronger relationship with intensity than sadness as it is a supplication emotion, which usually is expressed with high intensity (Scherer, 2003; Juslin & Laukka, 2003). In terms of anger, the relationship to intensity would be less clear since hot anger, as opposed to cold anger, is usually defined as having high intensity (Scherer, 2003). The raw scores of data were included in the analysis without any further processing. Moreover, the operators rated the need for help expressed by the caller, where 1 equaled limited help needed and 8 equaled a need for intensive help. This scale was used to obtain a fine-grained continuous measure, and mirrored the authentic decision-making scale the operators have in their pre-scripted decision protocol. The ratings were converted into the medical coding (see Table 1) in order to capture verbal descriptions of events that are expected to be expressed in each decision category (descriptions of cardiac arrests are more likely to be described in Level 4 than in Level 1). Coding of Medical Severity and Help Need. Severe help needed 7–8 4 Suspicion about severe and acute event, such as a cardiac arrest. The closest emergency vehicle is sent to the scene with “blue lights”. Moderate help needed 5–6 3 Suspicion about an acute event, without immediate life threatening symptoms. The closest available ambulance is assigned, but without “blue lights”. Minor help needed 3–4 2 The health condition of the patient is still prioritized, but the case is not considered acute. An ambulance is sent to the scene, but with an expected delay. No “blue lights”. Limited or no help needed 1–2 1 The patient may be transported to health care by other means than an ambulance (such as taxi or public transportation). No monitoring of the patient is needed during transport. Finally, we controlled for outcome reversibility in order to check that operators displayed variations in their ratings and did not only rate emotional expressions based on how they assessed the help need level and vice versa. In other words, we looked for examples of when operators rated a high-help need, but provided a low rating of emotions and vice versa. In the high-help condition (4) there were 9 instances for anger, 14 for sadness and 12 for fear, which were rated 1–3 for clarity of emotional expression. Conversely, in the low-help need condition (1) there were 6 instances of anger, 6 for sadness and 12 for fear, which were rated 7–10 for clarity of emotional expressions. The operators reported significant variability in emotional expressions, causing an in-depth analysis of the ratings (see means in the left-side column of Table 2). Fear (MFear 4.29, SDFear 3.55) was the overall most clearly expressed emotion across all help need levels, followed by sadness (MSadness 2.77, SDSadness 2.98) and anger (MAnger 1.84, SDAnger 2.93). Descriptive Data of Emotional Clarity and Intensity Across Help Need Levels. Analyzing the confidence intervals (95% CFIs) in Table 2 and Figure 1, fear is significantly separated from other expressions in acute events (Level 4), but as the CFIs for expressions within moderate (Level 3; see Table 2) and less acute events (Level 2) partially overlap additional testing was done. The one-way Anovas’ showed overall significant differences between expressions in respective level; Level 4 F(2, 177) = 13.49, p = 0.01; Level 3 F(2, 75) = 3.97, p = 0.02 and Level 2 F(2, 75) = 4.17, p = 0.02, but not for uncritical events (Level 1): F(2, 102) = 2.13, p = 0.12. Clarity of Emotional Expression in Medical Decisions. Tukey’s post hoc tests showed that the perception of fear (MFear 4.85, SDFear 3.90, p = 0.00) is significantly different from both anger (MAnger 1.72, SDAnger 2.92) and sadness (MSadness 2.80, SDSadness 3.15), while the difference is not significant between sadness and anger for the most severe cases (Level 4). In moderately acute events (Level 3), fear (MFear 3.69, SDFear 3.08) is significantly differently perceived from anger (MAnger 1.38, SDAnger 2.71, p = 0.02), but not from sadness (MSadness 3.00, SDSadness 3.27, p = 0.69). Similarly, in less acute events (Level 2), fear (MFear 3.84, SDFear 3.34) is significantly differently perceived from anger (MAnger 1.52, SDAnger 2.63, p = 0.02), but not from sadness (MSadness 2.12, SDSadness 2.83, p = 0.11). Since fear is significantly discriminated from both anger and sadness in the most acute situations (as well as from anger in all but the uncritical condition), we find support for H1. Operators are not indifferent to callers’ emotions and operators perceive fear to be most clearly expressed when help is needed. Consequently, since sadness and anger showed overlap across all levels we did not receive support for H2 and H3. Returning to H4, we conducted three Sobel tests supporting mediation in the model (fear, z = 4.64, p = 0.00; anger, z = 1.60, p = 0.10; sadness, z = –1.65, p = 0.10). The hypothesized relationship that supplication emotions (fear) would affect emergency decisions positively (and anger negatively) and be mediated by intensity, was supported in the case of fear (β = 0.65; p < 0.00, indirect effect β = 0.08; p < 0.00), but not for sadness (β = –.05; p > 0.05) or anger (β = 0.02; p > 0.05). Intensity, as expected (H4), was related to emergency decisions (β = 0.37; p < 0.00). The model explains between 14–39% of the variance in the dependent variables. The results for the SEM analysis are shown in full in Figure 2. 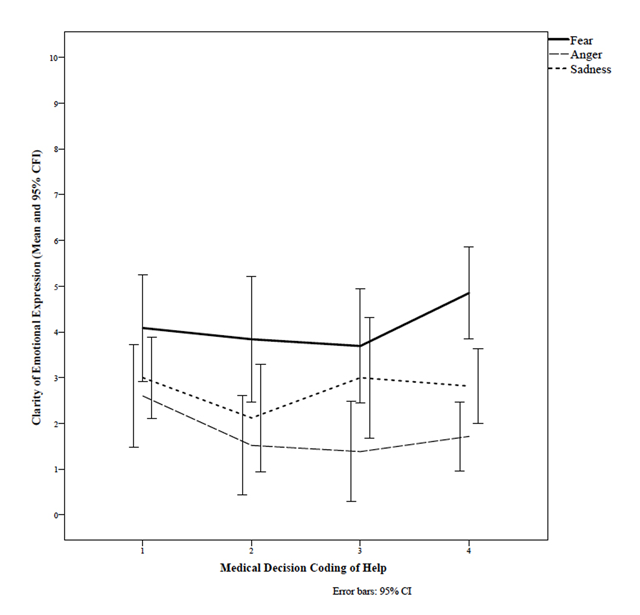 The Influence of Emotional Expressions and Intensity of Expression on Emergency Decisions. A test of indirect effects provides stronger and more stable evidence of mediation than if a single path at a time is examined (Baron & Kenny, 1986). 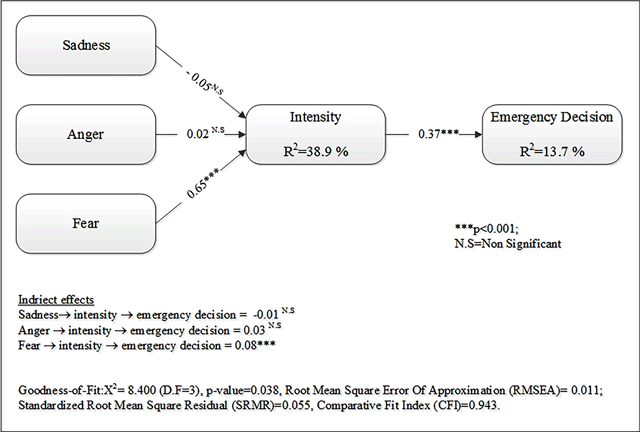 As Figure 2 shows, there was a significant indirect effect (0.08) of the Fear→Intensity→Emergency decision path. Furthermore, proposing mediation of all effects revealed that intensity mediates and thus strengthens the effect of fear on emergency decisions. To further support mediation we also removed the direct path to intensity and added a direct path from fear to help needed supporting full mediation. The mediated model supported path dependency. Following decision routines strictly, operators ought to be indifferent to emotional expressions in their assessment. The results demonstrate how rapidly executed decisions are dependent on both the type of vocal expressions and the intensity with which it is expressed. The study reveals that operators distinguish and thereby attend to emotional expressions within acute medical conditions as well as between acute and non-acute conditions. These findings are important for at least three reasons. First, fear has been described as being more difficult to detect than anger and sadness (Juslin & Laukka, 2003), yet it supported operators in this study as they executed emergency decisions. Operators are thus specifically attentive to this signal. Second, given that emotions are disruptive reactions to events and serve to assist in making inferences about others (Hareli & Hess, 2010; Van Kleef, DeDreu & Manstead, 2010), the understanding of verbal expressions may hinge on emotional expressions, rather than the other way around. Thus, the influence of particularly intensely expressed fear emotions must not be overlooked. Third, our findings confirm Alfsen et al. (2015) by underscoring that emotional expressions become an important aspect of assessment. Hence, the findings contrast and also extend previous research by Eisenberg et al. (1986), Clawson & Sinclair (2001) and Ma et al. (2007) by showing that various emotional expressions not only exist, but also vary across decision levels and have the strongest influence on provision of help in the most severe cases. Potential explanations for the lack of support for anger to reduce and sadness to increase perceptions of the level of help needed is explained by the operators’ competence in assessing emotional expressions. For instance, the emergency operators’ professionalism may help them to re-interpret anger as a sign of confrontation regarding ongoing emergencies, where callers are displaying frustration over having to negotiate help. Thus, displays of anger may be re-appraised by the operator as more manageable expressions, such as fear, downplaying the negative relationship. The operators may then make secondary appraisals regarding what the callers’ expression signals. The lack of support for sadness as triggering increases in perceptions of help needed may be found in that sadness is a signal that an event has already happened, rather than being a signal of an ongoing emergency. Thus, the signal implies help, but in a way that disqualifies provision of actual help since from a medical point of view, there is little the operator could do to reverse the outcome. Conducting field-based research is complicated as regards both access and procedure. However, the randomized sample selection, the counterbalancing of rating sheets, the search for counterfactual examples as well as reliance on validated and previously accepted scales, all safeguard against foreseeable confounds in the research design. However, future research should focus on controlling intrapersonal variables, such as operator’s emotional intelligence, that may affect detection of emotional expressions, or how matters of emotional regulation affect re-appraisals of emotional expression. Finally, emotion-laden decisions are unlikely to be failsafe in terms of indicating medical emergencies, yet they are functional, as they signal urgency and may help to frame information and thereby provide faster decisions. Thus, being skilled in using emotional expressions as proxies for emergencies has consequences for how operators frame and make decisions as well as how fast help will arrive. It is worth noting that a small improvement in lead time on the individual level could turn into minutes or hours given the great number of calls operators answer each year. 1The emotional content in Ma et al.’s (2007) and Clawson and Sinclair’s (2001) studies was rated 5 = uncontrollable hysterical, 4 = uncooperative not listening, yelling, 3 = moderately upset, but cooperative, 2 = anxious, but cooperative and 1 = normal conversation. In Ma et al.’s 2007 study, conducted in Taipei, the overall mean emotional content was 1.42; in Clawson and Sinclair’s 2001 study it was 1.05 for British Columbia and 1.21 for New York State. 2The operators receive internal education in medicine and communication as well as answer a large body of calls on a daily basis. The training and experience makes them likely to develop expertise in this domain. Vidrascu, L., & Devillers, L. (2005). Detection of real-life emotions in call centers. Interspeech, 10, 1841–1844.